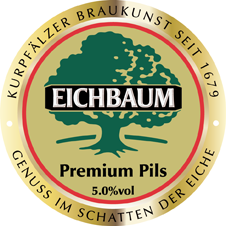 Eichbaum beers are brewed strictly according to the Reinheitsgebot (purity law) of 1516; the oldest, still valid food law in the world. 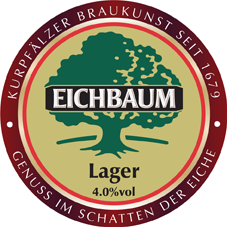 According to it, only malt, hops, yeast and water may be used to brew beer giving Eichbaum a distinctive quality and taste. Eichbaum dates from 1679; a Walloon, Jean du Chène established a brewery with its own tavern, which he named Eichbaum – his surname in German (oak tree in English). It is the oldest brewery in Mannheim, and although it has been at different locations since, its headquarters have always been in the city and it is one of the leading breweries in Baden-Württemberg. 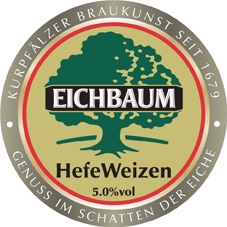 Eichbaum obtains the majority of their hops from the Hallertau, the growing region situated almost in the middle of Bavaria. Hops have been cultivated here since the 8th century and is the largest growing area in Germany.These hops contribute to the delicate tangy taste of Eichbaum. For the malt, they primarily use malting barley from the Palatinate region around the Rhine. Water used for brewing plays an important role in any beer’s character, and the brewery relies on water drawn from three of its own wells at a depth of more than 100 metres, where it has been stored for thousands of years below an impermeable layer free from surface influences. Thus, it is of real mineral water quality.